LOS ANGELES – 28 November 2018 – The Internet Corporation for Assigned Names and Numbers (ICANN) today announced an update to the WHOIS Self-Test Tool available as part of Registry System Testing (RST). The update now allows for Registry Service Providers to self-test WHOIS functionality for fields with redacted data. The new feature is a follow-up to the RST update announced on 1 August 2018, which allowed for the acceptance of redacted data responses during WHOIS testing, in accordance with the Temporary Specification for gTLD Registration Data adopted by resolution of the ICANN Board of Directors on 17 May 2018. Registry System Testing (RST) ensures that a Registry Operator has the capacity to operate a new generic Top-Level Domain in a stable and secure manner. Every aspiring Registry Operator (RO) must demonstrate that it has established operations in accordance with the technical and operational criteria described in the Applicant Guidebook (Module 5: Transition to Delegation) prior to delegation into the root zone of the Internet. Additionally, once a TLD is delegated to the root zone, any changes to back-end operations may require a new RST test to ensure the stability of those services. For example, when an RO submits an RSEP, changes their RSP, modifies their IDN tables, or modifies their registry service in other ways that are described in the RA, the corresponding RST test type will be required. Registry system testing covers the critical registry functions as described in the Registry Agreement (RA). There are several test elements (areas) that make up a test appointment. Below are the test elements that make up the majority of RST types. DNS – Testing operability with the Domain Name System protocols. WHOIS – Testing the records containing registration information about registered domain names. EPP – Testing the implementation of the protocol used for electronic communication between a registrar and a registry for provisioning domain names. Internationalized Domain Name (IDN) – Reviewing and/or testing domain names that include characters not written with the basic Latin alphabet (a - z). Data Escrow – Testing to ensure that registries are able to make successful data deposits with their Data Escrow Agents. Documentation – Review of self-certification documents (XML) to ensure required elements are accounted for. Registry System Testing requirements vary depending on the services they support. In pre-delegation change testing and RSP change testing all test elements are included in the test appointment. Other registry services may only require a subset of the test elements. The following is a list of current test types, as well as a description of when they apply. Pre-Delegation Testing ensures that a successful applicant to the New gTLD program has the capacity to operate their TLD in a stable and secure manner. Every new Registry must demonstrate that it has established operations prior to being introduced to the root zone. 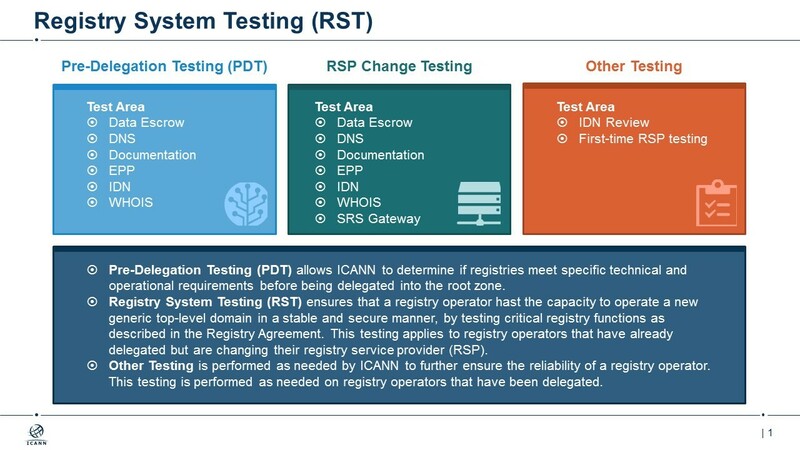 Similar to PDT (above), RSP testing is designed to ensure that a previously delegated TLD can continue to run successfully. Depending on the type of RSP change being made by the RO, the testing requirements may differ. The Standard RSP Change Test comprises the same elements as PDT, including the full suite of tests, and is required when an RO changes their RSP (Back-End). A SRS Gateway service is a SRS implementation that acts as a proxy between a subset of Registrars and the Registry. ROs interested in implementing an SRS Gateway service must validate the operability of their provider's SRS via an RSP Change Test. For ROs wishing to make modifications to their Internationalized Domain Name (IDN) tables and service offerings, an IDN RST Review of the language and/or script tables is required. This set of tests is performed when an RSP has not operated a gTLD before and the string for which they will provide services is already delegated and has registrants. This testing is done in addition to the relevant RSP change test listed above. In this test, the RSP places simulated TLDs in the production environment, which is then monitored for compliance with the relevant DNS/DNSSEC specifications and the Service Level Requirements described in Specification 10 of the Base New gTLD Registry Agreement. The RSP is required to perform ZSK and KSK rollovers during the simulation period. The following is a list of resources to help a registry complete Registry System Testing. Answers general questions about the RST process and requirements. A detailed guide for starting Registry System Testing. Includes links, screenshots and instructions. Information on how to prepare for Registry System Testing. A collection of templates applicants are required to use to upload technical information to the RST system. Detailed test plans and cases that collectively make up Registry System Testing.